Canadian journalist Dewar (Bones, 2001) tackles the whole business of stem cells, cloning, and other at-the-edge science in a text composed largely of long interviews with various movers and shakers. And business, she contends is what it’s all about. The not-hidden agenda of the text is the oft-repeated refrain that science and capitalism now go hand in hand; that academia is being bought by corporations; that scientists have made fortunes in biotech; and that even bioethicists command huge consultants’ fees for their advice. As far as regulation is concerned, forget it. Government (at least in Canada) doesn’t have a clue. Add to this the title reference to Genesis: Adam and Eve were banned from Eden because they ate from the Tree of Knowledge, forever depriving them from the second Tree—of Life. But it’s the tree of life that Dewar sees as the quest of “hubristic” scientists in a field she calls “revelationary.” Such would include Advanced Cell Technology’s Michael West, who started out hoping to “cure” aging by finding the gene that allows cells to keep dividing. And it would include James Watson, who comes in for major attack, along with the Cold Spring Harbor enterprise he has long directed. And Craig Venter. But for all Dewar’s rants, she has raves as well: for Fred Sanger, Sidney Brenner and John Sulston; and, in one nice chapter, the bioinformatics geeks who saved the US government and Celera by creating the software that allowed assembly of the rough drafts of the human genome. 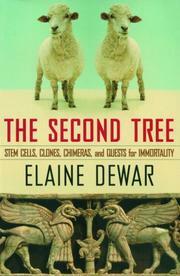 Does the reader learn about the science and ethics of stem cell and cloning research? Yes, Dewar does all right there, but her descriptions are so often covered up by portraits of the personalities involved, their motives, competitors and backbiting, as well as by her own intrusive presence, with her questions about their beliefs in God, that you want to shake her. Same with her many digressions—including a long sketch of Darwin. If ever text called for editor, this is it.